Dr. Jim McMan us is a Professor of Oceanography at Oregon State University. 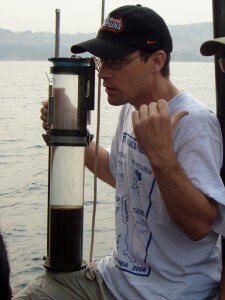 He has participated in many field expeditions in which he has investigated various aspects of Earth’s biogeochemistry. His research is primarily focused on modern geochemical processes, but includes work relevant to past ocean chemistry and climate as well. Dr. McManus has investigated trace element and organic carbon cycling in marine and freshwater systems from many locations throughout the world including Lake Tanganyika, Lake Superior, Crater Lake (Oregon), the Eastern, South, and Equatorial Pacific and currently, the Gulf of Mexico. On this cruise his primary research focus will be on how hypoxic conditions influence the chemistry of trace metals (specifically iron) in the ocean. I suppose that the defining moment for me was when I was a sophomore in college. I was taking an Ecology class and I have this memory of the professor talking about element cycling in soils (I believe that he was even actually talking about iron). Anyway, I remember thinking that “this is what I wanted to do for the rest of my life”. Of course the answer is more complicated than that and there were some twists and turns along the way, but basically I got interested in the chemistry of the environment at that point. My undergraduate major was Chemistry and my graduate degree is in Oceanography. I had many interesting (and fun) courses as an undergraduate, and I remember enjoying many of my non-science electives as well as my science classes. I cannot really say that I had a least favorite as an undergraduate student. As much as it is possible, take a variety of classes in college, and put as much into all of your classes that you can.